THE evening of 13 March 2013, the first words of the newly-elected Pope Francis to the people gathered in St. Peter’s Square and throughout the world were: “Buona sera” - “Good evening”. The language and style of Pope Francis’ new text are as simple as this greeting. The Exhortation is not quite as brief as this simple salutation, but is similarly close to reality. In these 200 pages Pope Francis speaks about “love in the family”, and does so in such a concrete and simple way, with words that warm the heart like that good evening of 13 March 2013. This is his style, and it is his hope that aspects of life are spoken about in the most concrete way possible, especially with regard to the family, one of the most elementary realities of life. But what does this mean in practice? Many rightly ask this question. The definitive answers are found in Amoris Laetitia, paragraph 300. These answers certainly offer material for further discussions, but they also provide an important clarification and an indication of the path to follow. “If we consider the immense variety of concrete situations … it is understandable that neither the Synod nor this Exhortation could be expected to provide a new set of general rules, canonical in nature and applicable to all cases”. “What is possible is simply a renewed encouragement to undertake a responsible personal and pastoral discernment of particular cases”. Pope Francis mentions two erroneous positions. One is that of excessive rigour: “a pastor cannot feel that it is enough simply to apply moral laws to those living in ‘irregular’ situations, as if they were stones to throw at people’s lives. This would bespeak the closed heart of one used to hiding behind the Church’s teachings” (AL 205). On the other hand, the Church must certainly never “desist from proposing the full ideal of marriage, God’s plan in all its grandeur” (AL 207). Naturally this poses the question: what does the Pope say in relation to access to the sacraments for people who live in “irregular” situations? Pope Benedict had already said that “easy recipes” do not exist (AL 298, note 333). Pope Francis reiterates the need to discern carefully the situation, in keeping with St. John Paul II’s Familiaris consortio (84) (AL 298). “Discernment must help to find possible ways of responding to God and growing in the midst of limits. By thinking that everything is black and white, we sometimes close off the way of grace and of growth, and discourage paths of sanctification which give glory to God” (AL 205). He also reminds us of an important phrase from Evangelii gaudium, 44: “A small step, in the midst of great human limitations, can be more pleasing to God than a life which appears outwardly in order but moves through the day without confronting great difficulties” (AL 304). the Eucharist “is not a prize for the perfect but a powerful medicine and nourishment for the weak” (EG 47). All because, after two wild and wooly synods on the family, Pope Francis brought us all the way to the very edge of making a decision between the synod’s two conflicting episcopal views on Communion for the divorced and remarried (and not annulled)—and left all of us hanging. Why? Is pushing the panic button now justified on both sides of that issue? Not so fast, folks. What’s Up With Pope Francis and Amoris Laetitia? It struck me that this precise thing was happening to the two synods on the family. The “synod of the media” was all about the hot-button issues, with the top issue being Communion for divorced/remarried (not-annulled) Catholic. The real and all-important question was, and remains, what is the “synod of the Father”—the Holy Father—really focused on? With such a range of views and proposals emanating from two confusing synod processes, all of which has no official standing whatsoever, in terms of affecting the Church directly, what would the official conclusion—Pope Francis’ post-synodal apostolic exhortation—reveal to us? Well, the “synod of the media” was also the only synod encountered by many of the faithful. So, on April 8, the reception of Amoris Laetitia naturally continued to feed the erroneous view that this document would ultimately be all about resolving the media’s and many Catholics’ fixation on the question of Communion. And, of course, the exhortation, it turns out, wasn’t about that. At all. How frustrating for so many to have their expectations derailed, one way or the other. The synod of the Holy Father, it turns out, was different from the “synod of the media.” All the same, “interpretations” of the text came hurtling forth from all forms of armchair experts, such that the synod of the media continues to push aside Francis’ authentic voice and intention for his exhortation. A political term comes to mind regarding how Pope Francis has navigated his way through the last two or more years of the synods and his final text—brinkmanship. Webster’s would define the term as “the practice of causing or allowing a situation to become extremely dangerous in order to get the results that you want.” Perhaps that’s not a bad description of what we have seen. I would assert that Francis has, all the while, deliberately left unresolved this crucial question of the “synod of the media” precisely so that he can continue to resolutely point the Church toward his synod, so to speak. This will, of course leave a huge number of Catholics of every ideological stripe greatly disappointed. But remember, this is the pope of “the mess”—getting out into the streets and into the mess in order to proclaim the Kingdom through personal encounter. Also remember the Fourth Commandment—please! I have seen so many violations of the Fourth Commandment in the comments of those who are wrapped up in the view that Pope Francis is harming the Church that they throw him completely under the bus and show his office as Vicar of Jesus Christ no respect whatever. We must continue to honor our father, fellow Catholics, even if we disagree. But, one might continue, respectfully, to disagree and say that the Pope’s “brinkmanship” on the question of Communion for the divorced-remarried (not-annulled) is wreaking havoc in both directions. Isn’t all this ambiguity really bad? One side note in all this is that “brinkmanship” is not necessarily a new phenomenon when it comes to the papacy. Indeed, it’s precisely the kind of thing one would expect to see in the office of the Papacy if it is really exercised under the guidance of the Holy Spirit, Who protects the Pope and the Church against universally teaching error in faith and morals. So, let’s assume for a moment that the “worst-case-scenario” here is true, taking the reactionary view that Pope Francis is totally dedicated to undermining the Church’s understanding of the crucial importance of worthily receiving Communion in a state of grace. If this were true, and if he had the courage of his convictions, he could just teach what he believes is true. After all, to whom does he answer? Well, to God, of course. To the Holy Spirit. Even in this worst case, guess what? A pope would indeed be somehow prevented from universally and formally teaching error. “Brinkmanship” is exactly as far as a Pope could ever go with this kind of error before running squarely into the Holy Spirit. Yet, I don’t find the reactionary view of Francis persuasive at all, so even though it’s deeply important that Amoris Laetitia does not universally teach any error, I’ve been continuing to look for additional clues regarding the Holy Father’s “synod.” He gave us an absolutely vital clue during his recently concluded press conference on the papal plane returning this past weekend from Greece to Rome. For a Catholic who wants to know: are there new, concrete possibilities that didn’t exist before the publication of the exhortation or not? I can say yes, many. But it would be an answer that is too small. 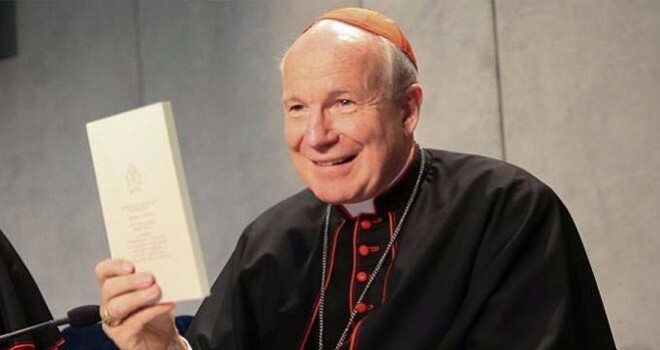 I recommend that you read the presentation of Cardinal Schonborn, who is a great theologian. He was the secretary for the Congregation of the Doctrine of the Faith, and he knows the doctrine of the faith well. In that presentation, your question will find an answer. This means we have to examine closely what Cardinal Schonborn said in his introduction of the papal exhortation. What Did Cardinal Schonborn Say? 2. All persons are neither “cases” nor “categories” but are the subjects of “discernment” and “accompaniment”—tasks required of the Church for all persons regardless of whether their circumstances are “irregular” or not. 7. Importantly, Schonborn explains what the Pope is thinking regarding “access to the sacraments for people who live in ‘irregular’ situations”: “Pope Benedict had already said that ‘easy recipes’ do not exist (AL 298, note 333). Pope Francis reiterates the need to discern carefully the situation, in keeping with St. John Paul II’s Familiaris Consortio (84) (AL 298). ‘Discernment must help to find possible ways of responding to God and growing in the midst of limits. By thinking that everything is black and white, we sometimes close off the way of grace and of growth, and discourage paths of sanctification which give glory to God’ ” (AL 305). Readers, did you notice that Schonborn clearly states that Francis intends all this “discernment” to be in keeping with Familiaris Consortio and its paragraph 84—the precise paragraph in which we read: “However, the Church reaffirms her practice, which is based upon Sacred Scripture, of not admitting to Eucharistic Communion divorced persons who have remarried”? And did you notice that the Holy Father himself says in the exhortation (AL 305) that this discernment is supposed to help find ways of spiritual growth “in the midst of limits”? What limits? One “limit” particularly comes to mind, doesn’t it? Francis then intentionally avoids giving examples of these cases in the footnote. Why? He’s not interested in changing lenses at this point. He’s still looking at all of us, “regular” or “irregular,” with the loving and welcoming eyes of Jesus Christ. One of the recent popes, speaking of the Council, said that there were two councils: the Second Vatican Council in the Basilica of St. Peter, and the other, the council of the media. When I convoked the first synod, the great concern of the majority of the media was communion for the divorced and remarried, and, since I am not a saint, this bothered me, and then made me sad. Because, thinking of those media who said, this, this and that, do you not realize that that is not the important problem? Don’t you realize that instead the family throughout the world is in crisis? Don’t we realize that the falling birth rate in Europe is enough to make one cry? And the family is the basis of society. Do you not realize that the youth don’t want to marry? Don’t you realize that the fall of the birth rate in Europe is to cry about? Don’t you realize that the lack of work or the little work (available) means that a mother has to get two jobs and the children grow up alone? These are the big problems. In not deciding, Pope Francis leaves in place everything about that issue that has been previously taught and practiced by the Church. So, living as husband and wife and having sexual relations in an adulterous union will continue to result in those persons being prohibited from receiving Communion—how could it not, since Canon Law and Church discipline prior to Amoris Laetitiae remains identical more than a week later? But Francis, like a loving father, is exhorting us—literally—to not let “his synod” be reduced to such a small question in the midst of the immense work we need to do on all the other problems. This work can only be done by seeing through Pope Francis’ eyes, not ours. And how can the Church’s sons and daughters fail to respond to his selfless example? He’s merely showing us how to love each other as Christ loves us. A so-called "Penitential Process" or "Penitential Path"